Justice League is a flagship title for the DC 52 reboot and it began with a fresh and exciting Apokolips arc. The book started five years in the past, which is theoretically the new lifespan of the 52 universe, with revised character introductions and interactions. It served its purpose well: a well paced plot, exciting explosive action, big superheroes doing heroic deeds and an immense antagonist, all perfectly suited to Jim Lee’s pencil. The heroes aligned proving that team is greater than the sum of its parts. Since it moved to present day DC the Justice League has been trundling along, quite slovenly. The last two arcs have been prosaic, not because they are badly written or drawn, but because they are very ordinary stories. The characters have yet to evolve and Johns has only invested time in Cyborg and Aquaman. Arthur Curry may have won over many a comic reader with his tussle between heritage and loyalty, but he fails to transfer this conflict here. 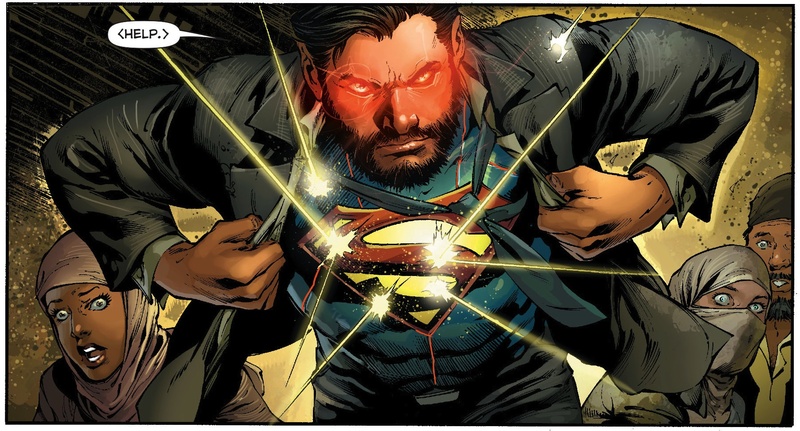 The Justice League crossover was good but not great and I can certainly appreciate the artwork by Ivan Reis. In any case this issue provides some intrigue in its evolving plot threads. Superman is dating Wonder Woman. Whilst it may be a slap in the face of Lois fans, some have hopefully had time to accept this divorce for new and exciting Clark stories. The superstar couple are battling terrorists in Kahndaq and are not being subtle about it. Batman serves notice that such open aggression only serves to increase agitation with the League and the United States. This newfound attention has led to the Batcave being broken into by an unknown entity, who steals Bruce’s “break glass in case of emergency” files on the League, raising massive concerns. There is a side plot with new members Atom and Firestorm, and their virgin call to League action. The writing is pretty safe and secure with slowly developing characters and plot. Geoff Johns is a honed craftsman who knows when to emphasis the spoken word and when to allow the artist to run wild. 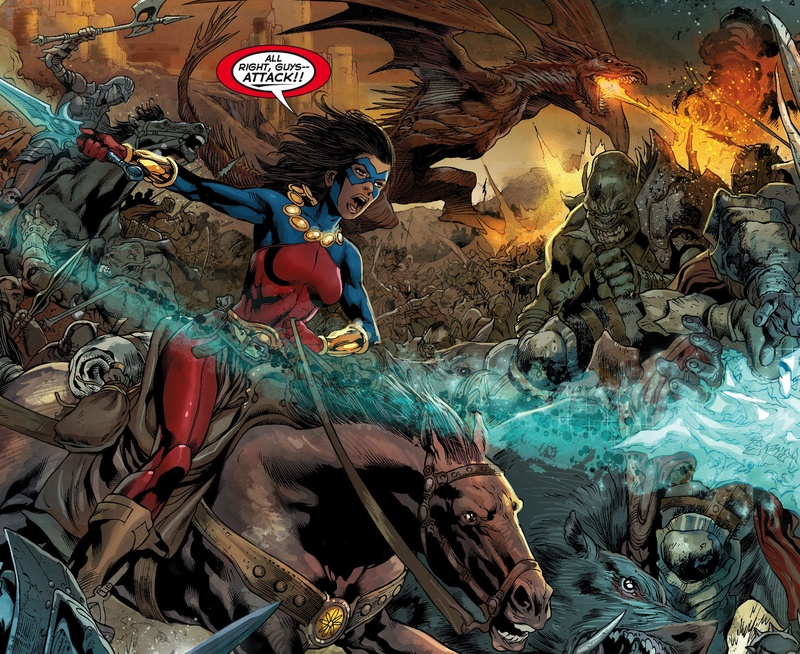 Ivan Reis has some lovely moments in this book, especially seeing Atom take on Orcs, in her laptop and Superman revealing himself to terrorists. He is faithful to Lee’s ability to show anger, pain and anguish in battle, giving intensity when it is required. As a technical exercise, the book succeeds on both levels. My problem with the Justice League is simple: it is boring. The characters have no depth and their relationships appear superficial. The majority are significantly better heroes in their solo books. The newly developed romance between Superman and Wonder Woman is affirmation of the stifling character progression. Take two incredibly powerful and boring characters and then put them in a relationship, and the results are mind numbing. Please do not misunderstand me, both characters can be written well and proof of this is the Morrison Action Comics run and the Azzarello Wonder Woman book. At least with Lois there was depth and texture to the relationship, because there were many inherent differences and she was vulnerable to his enemies. This does not exist with Clark’s current super powered and highly moral relationship and it only serves to distance him from his adopted planet. It is his humanity that makes him grounded and the champion of Metropolis. I am far from an expert on Diana and I shan’t make suppositions on her character, outside of the fact that Superman adds nothing to her persona the way Johns has written her. The development of Batman’s anxiety and scepticism seems to be the emerging plotline. This is far from a novel concept and it was well handled by Mark Waid’s Justice League and also in Greg Rucka’s OMAC prelude to Infinite Crisis. It is well-trodden ground that does not need a rehash, even if technically it did not occur in the current DC universe. We have seen great work from Geoff Johns with the Sinestro Corps War and Blackest Night and the development of Hal and Kyle was essential to these stories. I am unsure what has happened with this book because there is only one reason why I still buy it, Shazam. It is a great weekly ten-page story justifying Johns’ ability to write a decent solo hero story. Justice League is proving uninspiring and banal, despite having well rehearsed dialogue and great artwork. As a lead DC book this title has no redeeming features and cannot be saved by the pencilling alone. Ironically it is proving opposite to the Justice League and that the whole is certainly not greater than the sum of its parts.